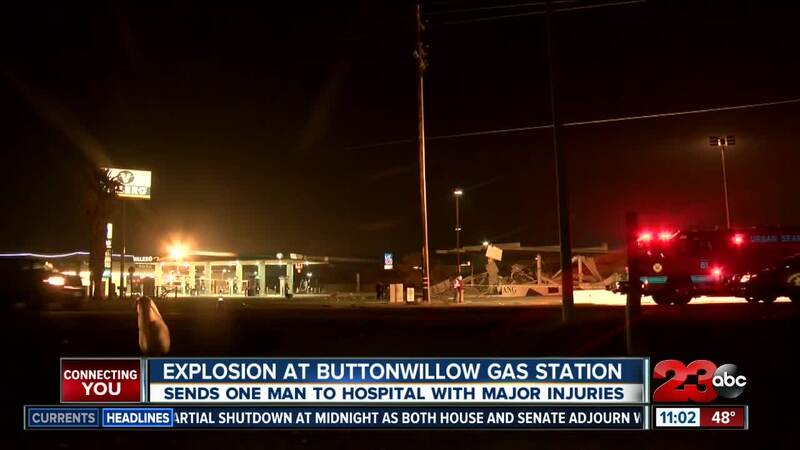 One man is being treated for major injuries after explosion at gas station. BAKERSFIELD, Calif. — Just after 4 p.m. on Friday, December 21the Kern County Fire Department received a report on an explosion on Highway 58 and I-5. Crews arrived on scene and found a tractor trailer with no fire and a collapsed fueling island canopy. Crews quickly secured the utilities by operating all emergency fuel shutoffs and rescue efforts were focused on the truck driver who was packaged on scne and transported to a local hospital. Westbound Highway 58 remains closed at I-5 while the investigation and clean-up efforts continue. One victim is en-route to the hospital after a report of an explosion at a Valero gas station. According to KCFD, they received reports of an explosion at a Valero gas station on southbound I-5 at SR-58. The canopy of the gas station did collapse as a result. The driver of a tractor trailer was taken to the hospital. According to KCFD, the extent of the driver's injuries is unknown at this time. CHP shut down the southbound I-5 off-ramp as well as the westbound and eastbound SR-58 traffic in that area. KCFD says there is no fire or gas leak at this time. According to Kern County Public Health Services, a hazmat team is en-route. The team will check any hazardous materials in the area, then assess any impact to people or the environment. Kern County Public Health Services will also assess any cleanup that is necessary.